Improper user access to applications can expose an organization to cyberattacks, with wide-ranging financial, social, public relations and legal implications for a compromised enterprise. To address these risks—and to meet regulatory requirements for authentication, data privacy and security—organizations sometimes find themselves wrestling with complex and costly access-management approaches. Complex IT environments and evolving workplace technology underscore the need to take a platform-based approach to access management for agility and flexibility. Having a platform means removing authentication logic from individual applications, to save development cost and deliver a unified end-user experience—and being able to rapidly adopt new applications. 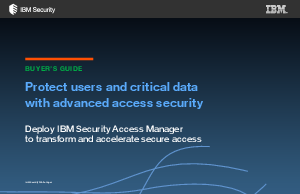 IBM® Security Access Manager provides such a platform.